Southport were promoted to the “A” Division of the Lancashire Combination for the 1904-05 campaign. They finished third behind Stockport County and Liverpool, their best placing in that league. It was also the season that central gained their most notable success to date when they won the Lancashire Senior Cup for the first and only time in their career. To reach the final they beat Earlestown 6-1 and Blackpool and Liverpool’s full first teams. The final was against Everton who fielded their reserve team at Sarisbrick New Road their first team having a cup engagement with Aston Villa the following day. Lawson and Smith gave Central a 2-0 lead at half-time and although Caldwell struck an upright and Dilly reduced the deficit, Central hung on to win a stirring game in front of 5,000 spectators Thereafter th e cup was on view in Fred Dunkerley’ sports shop during the day and taken to the police station every night for safe custody. In January Central transferred Jim Garvey to Bradford City for a £100 fee and a ‘match gate.’ During his 2 ½ year spell with the club he had been a tower of strength and a wonderfully agile goalkeeper. Garvey was the highest paid member of the staff and was also in receipt of a summer wage. The season was also the last the club played at Scarisbrick New Road, building development being imminent on the ground. The club first approached the Scarisbrick Estates with a view to obtaining anew ground but could not reach an agreement Several meetings were held with the Athletic Society but after inspecting their ground and being mindful of the cold winds which swept through the ground in winter the offer was not accepted. 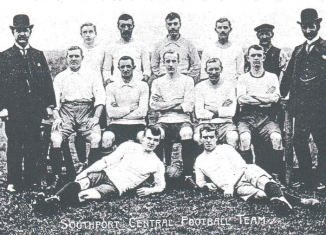 Few people who attended Southport Central’s Annual General Meeting in July 1905 would have believed it possible that the club would be holding a crisis meting in December but such was the case. At the AGM, the President, Sir George Pilkington had congratulated the club on “a most successful season if not the best they had ever had.” During 1904-05 the club had won the Lancashire Senior Cup and finished third in the Lancashire Combination.